Egypt has given the go-ahead for radar to be used to test a theory that Queen Nefertiti's crypt may be hidden in King Tutankhamun's tomb, an official said. The Antiquities Ministry said non-invasive radar would not cause damage. Archaeologist Nicholas Reeves believes the remains of Tutankhamun, who died 3,000 years ago aged 19, may have been rushed into an outer chamber of what was originally Nefertiti's tomb. The location of Nefertiti's remains is unknown. Those of Tutankhamun, who may have been her son, were found in 1922. Final security clearance for the test would probably be obtained within a month, said spokesman Mouchira Moussa. Dr Reeves, who has been in contact with the minister, is due to arrive in Cairo on Saturday, Mr Moussa added. Dr Reeves developed his theory after the Spanish artistic and preservation specialists, Factum Arte, were commissioned to produce detailed scans of Tutankhamun's tomb. While assessing the scans last February, Dr Reeves spotted what he believed were marks indicating where two doorways used to be. 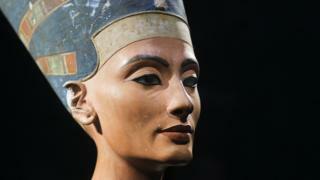 The archaeologist from the University of Arizona says he believes Nefertiti may lie inside. Tutankhamun's tomb was the most intact ever discovered in Egypt. Close to 2,000 objects were found inside. But its layout has been a puzzle for some time - in particular, why it was smaller than those of other kings' tombs. Dr Reeves believes there are clues in the design of the tomb that indicate it was designed to store the remains of a queen, not a king. The name Nefertiti means "a beautiful woman has come"